Are you ready for end-to-end student record management? From district transcript processing and SIS automation to Scan & Index for alumni records, Parchment has a solution for you. As the industry leader since 2003, with over 50% of our employees coming from the education industry, we’re here to support you as you help your students begin the next chapter of their lives. Speak with any of our representatives today and experience the difference between an average vendor and a true partner. 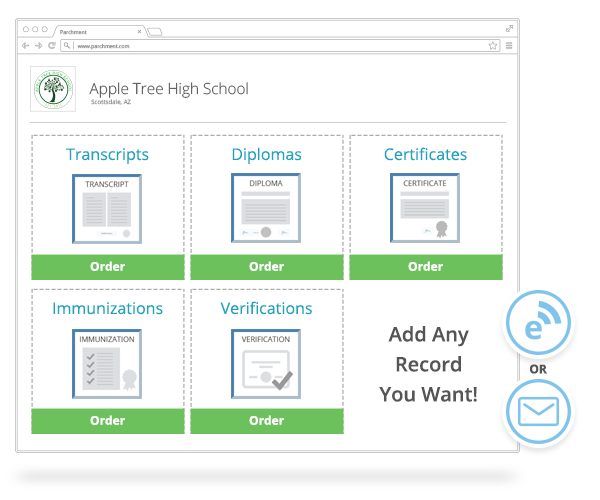 Whether you need a district transcript service or want to offer additional record types digitally, our platform can be customized to fit your needs. SIS integrations? Check. Verification requests? Bye Bye fax machine, we’ll take it from here. Electronic or print, we’ve got you covered. Raise your hand if you’re scared of that storage closet full of alumni records. You know the one. It takes hours to find that handwritten, tattered transcript from 1982. Let us scan those paper records and store them in the cloud so you always have instant access. Awesome. Learn to cut your time processing all records from hours to minutes by leveraging key resources. Our custom or standard sessions will introduce high school counselors to Parchment’s new system updates and functionality.